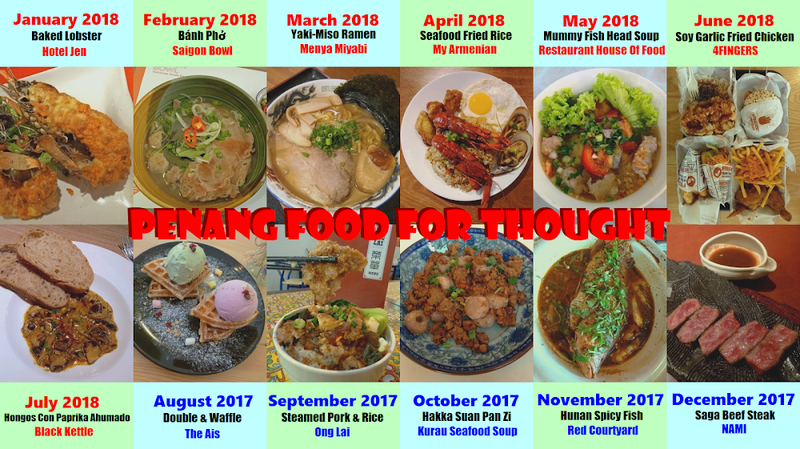 Special thanks to Spicy Lemak for extending this food review invitation. 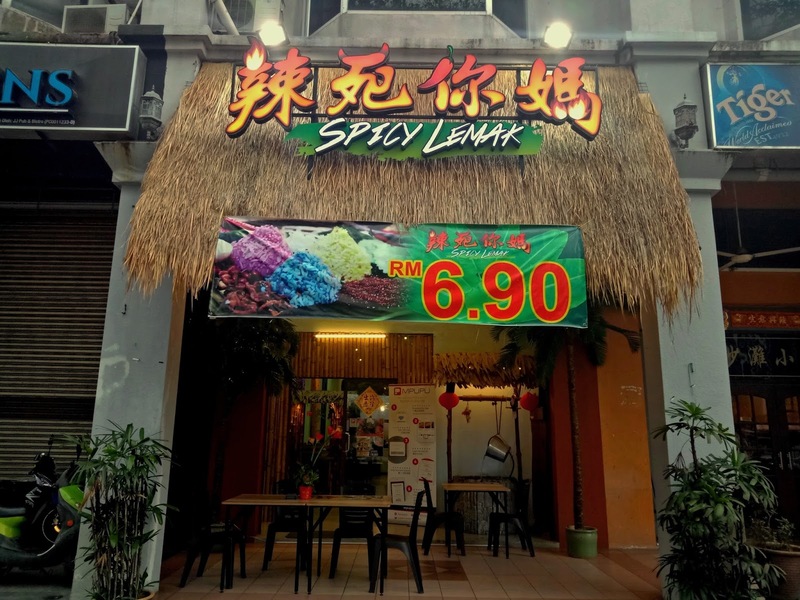 Spicy Lemak (辣死你妈) has 3 outlets in Penang: Beach Street (Lebuh Pantai), Burmah Road (Jalan Burma) and Automall. 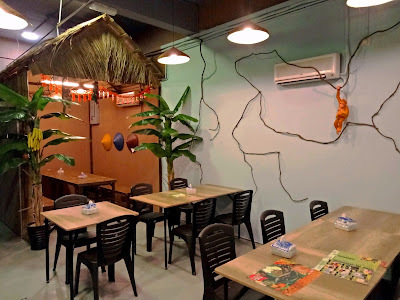 The Burmah Road restaurant is located at Wisma Soon, and is halfway between Burmahtel and Le Périgord. Spicy Lemak operates under the same management as Bangkok Garden. 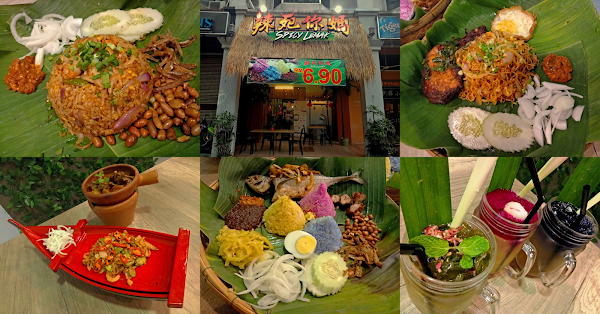 Each Spicy Lemak outlet is identified by an attap-thatched roof as its facade. As the name implies, Spicy Lemak's signature dish is nasi lemak. Its Chinese name is transliterated as "辣死你妈" instead of the usual "椰浆饭". This is a deliberate double entendre as it also implies that the food here is very spicy. 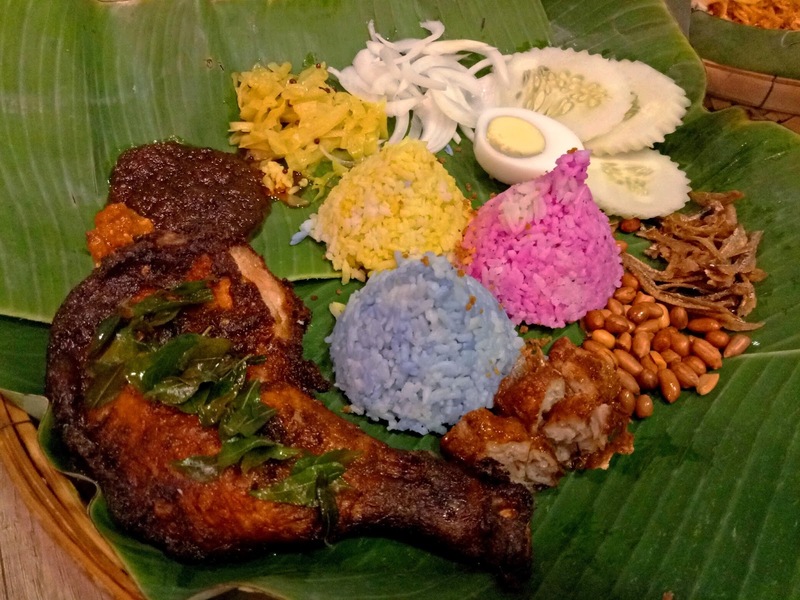 Spicy Lemak uses three types of rice for its nasi lemak. Rice is dyed using natural coloring: pitaya (red), turmeric (yellow) and butterfly-pea flower (blue). Rice is served over banana leaves for the extra fragrance. 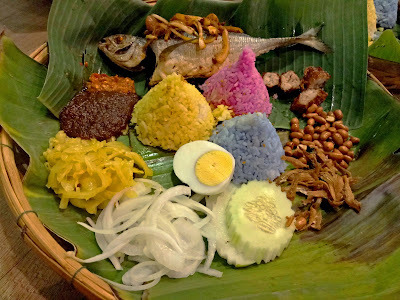 Other standard nasi lemak ingredients are lorbak (卤肉), hard-boiled egg, dried anchovies, roasted peanuts, fried cabbage, chopped onions and cucumber slices. 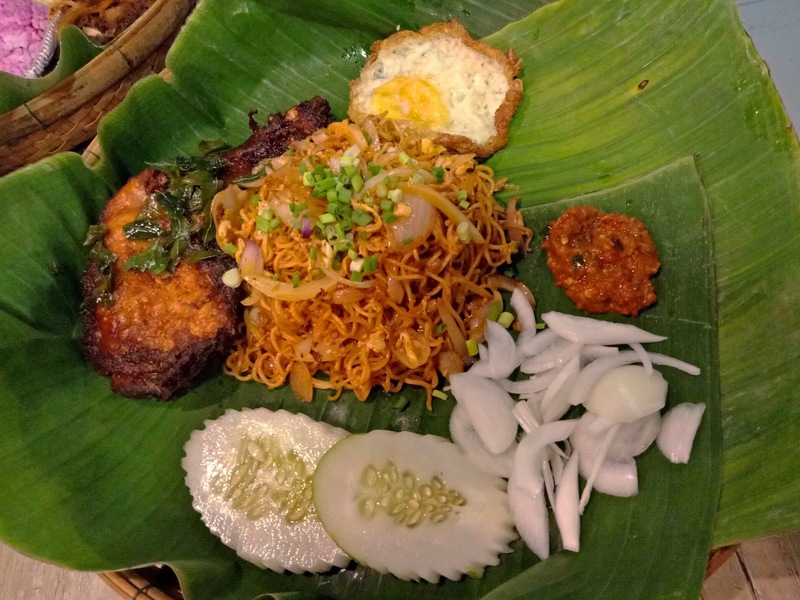 There are two types of sambal (chili paste); one of them is extremely spicy. 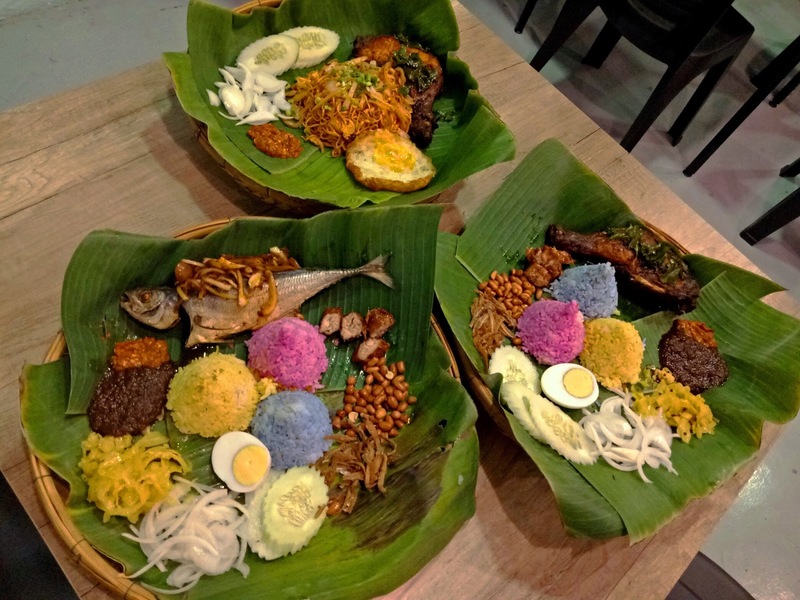 There are several versions of nasi lemak that differ in terms of meats. 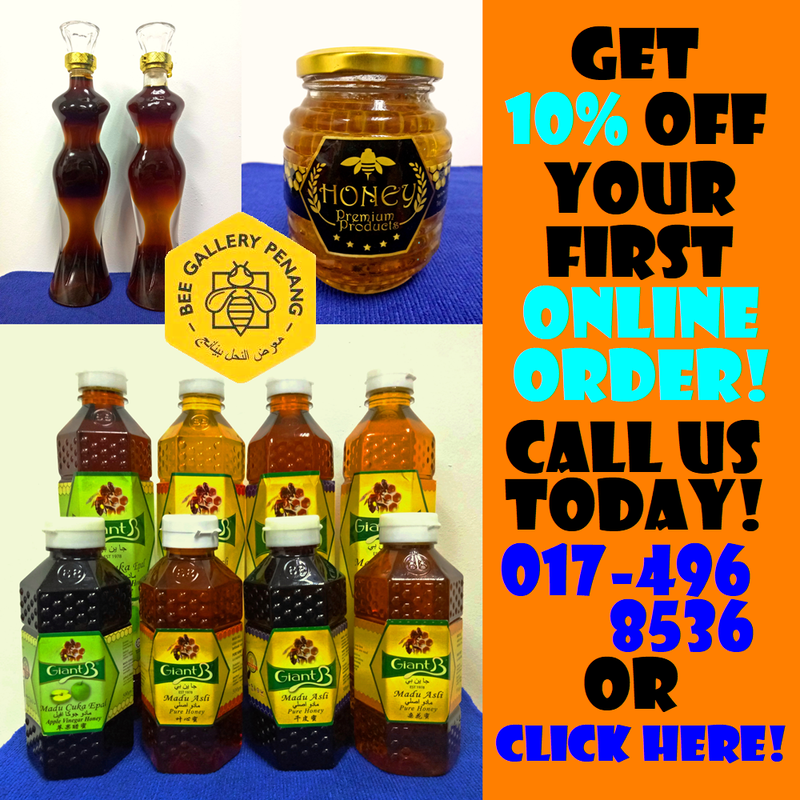 Spicy Lemak's bestsellers are Sambal Fish (RM14.90) and Chicken Whole Leg (RM14.90). For Sambal Fish, fried mackerel is slit open and is stuffed with sambal. Meanwhile, Chicken Whole Leg includes a piece of chicken thigh and drumstick that is marinated pretty well. For customers who prefer noodles, the Chicken Drumstick Fried Noodle (RM16.90) is a recommended choice. The fried noodle is quite tasty as it contains eggs, onions and scallions. A fried egg is included. My favorite dish today is Buah Petai Fried Rice (RM16.90). The fried rice is cooked with shrimps and petai (stink beans), culminating in a delectable taste which tantalizes my palate. I enjoy this dish very much; it is highly recommended. 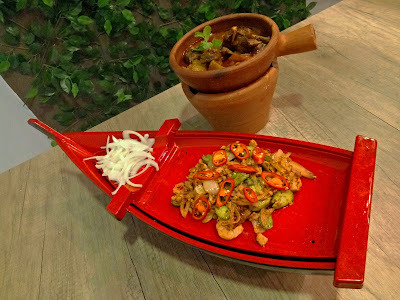 Spicy Lemak's food menu also includes several side dishes. The most popular choice is Buah Petai (RM18.80), which is served in a boat-shaped platter. In this dish, petai is stir-fried with shrimps, onions and red chili peppers. There are extra onions on the side. 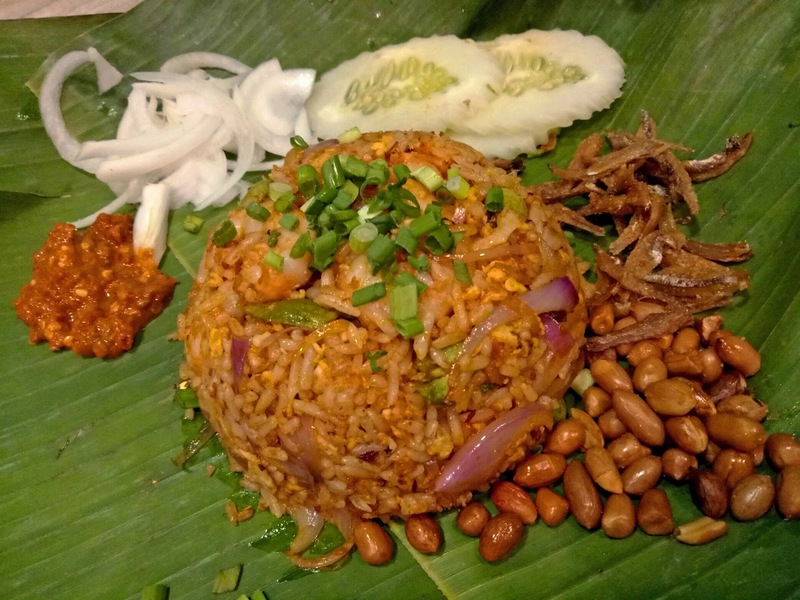 Petai lovers should not miss this dish. 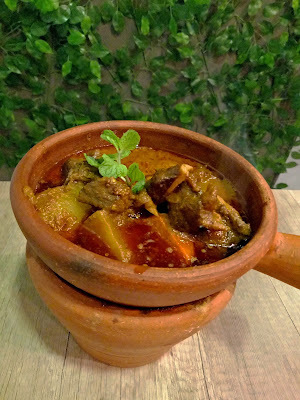 Another recommended side dish is Curry Mutton (RM19.80), a stew of mutton and potatoes in gravy. Served in a claypot, the curry is rich in coconut milk. I like the fact that the mutton does not have any unpleasant odor. 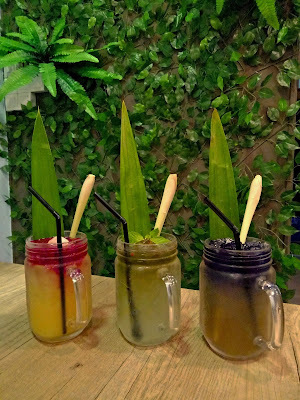 Moving on to beverages, Spicy Lemak has several mocktails on the menu: Laksjito (RM5.90), Dragon Fruit (RM5.90) and Vanda (RM5.90). 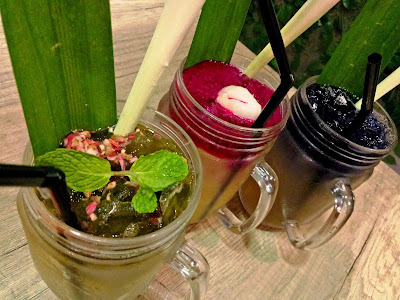 These iced drinks are visually appealing. 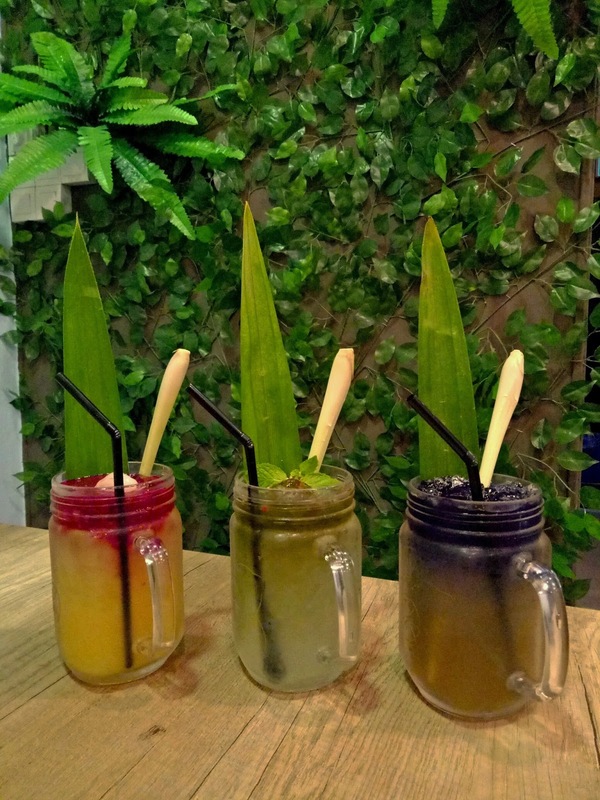 Laksjito contains lime juice, chopped ginger flower (姜花) and mint, making it an excellent thirst quencher. Meanwhile, Dragon Fruit consists of lime juice, blended pitaya and a piece of longan (龙眼). Last but not least, Vanda is a lemongrass drink that is dyed blue using the extract of butterfly-pea flowers. 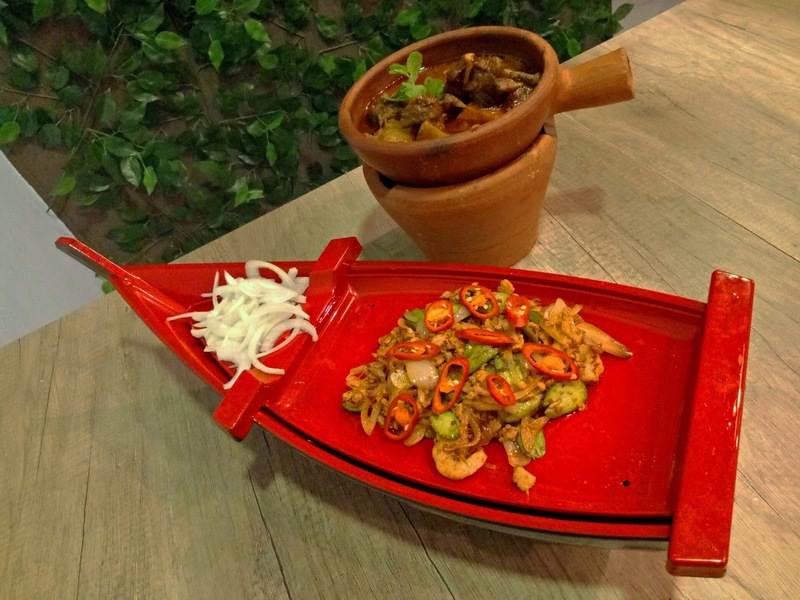 The food at Spicy Lemak is entirely pork-free. The restaurant is currently offering the Dinner Set (RM39.90) which is enough for 2 or 3 persons. The Dinner Set allows each diner to try several signature dishes in a single meal. Directions: Drive along Burmah Road (Jalan Burma) from Pulau Tikus direction. After the junction with Codrington Highway (Lebuhraya Codrington), turn right as you see Burmahtel. Spicy Lemak is located in the middle of this row of shops (Wisma Soon). It is exactly opposite of Petron gas station. Street parking is available along this service road.